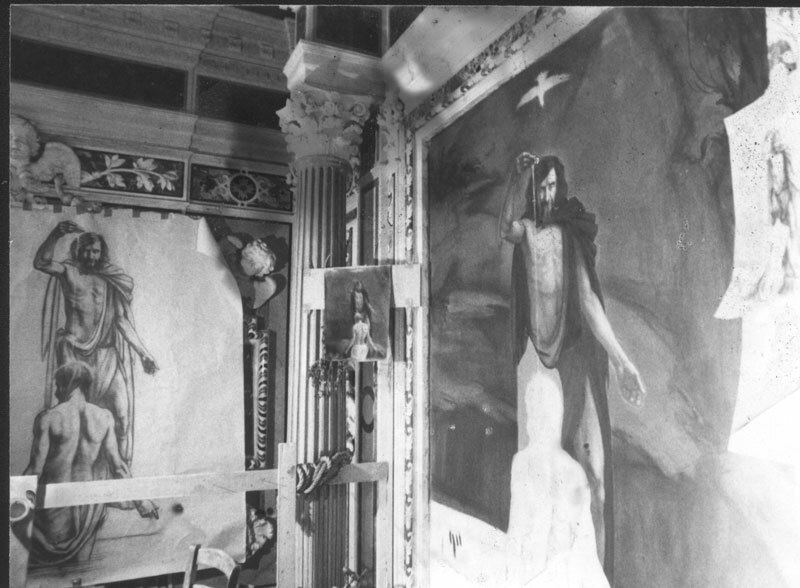 The gallery below contains images of the cartoon and the original studies for the fresco of John the Baptist for the chapel in the Basilica of Monte Cassino, Italy located 81 mi southeast of Rome at 1706 feet altitude. Saint Benedict of Nursia established his first monastery, the source of the Benedictine Order, here around 529. It was destroyed in WWII during the of Battle of Monte Cassino. Jan 17, 1944 – May 19, 1944; The Battle of Monte Cassio lasted 123 days during WWII. When the allies landed in Italy, the thought was to move straight up the boot of Italy in order to take hold of Rome..But, they were stopped by the Germans in the town of Cassino where the Abbey of Monte Cassino stood staring down their necks. For well over 6 months the allies advance came to a complete halt. 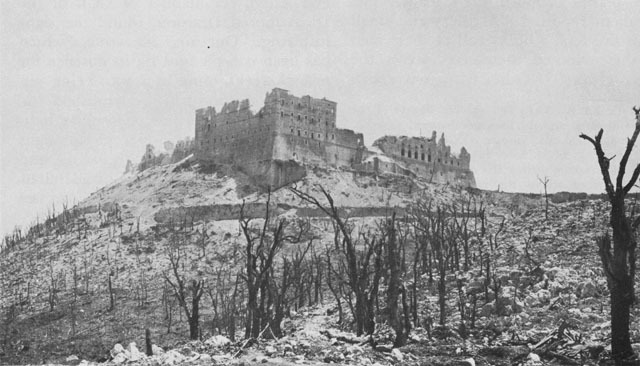 Because the Abbey completely dominated the entire valley the allies assumed (and it turned out wrongly) that the Germans were IN the abbey of Monte Cassino; Using it for their devastating artillery fire. Although both sides were trying not to destroy the Abbey, founded by St Benedict, because of its great historical and religious significance the order was finally given to bomb the Abbey of Monte Cassino. After the war, the Abbey was completely rebuilt. Almost exactly as it was but without the frescos that decorated the walls. They did not survive the battle. After the war the Abbey was rebuilt and in 1964 Pope Paul VI reconsecrated it. After eight years of study under the Italian artist Pietro Annigoni, Long was rewarded by a commission at the Abbey of Monte Cassino. 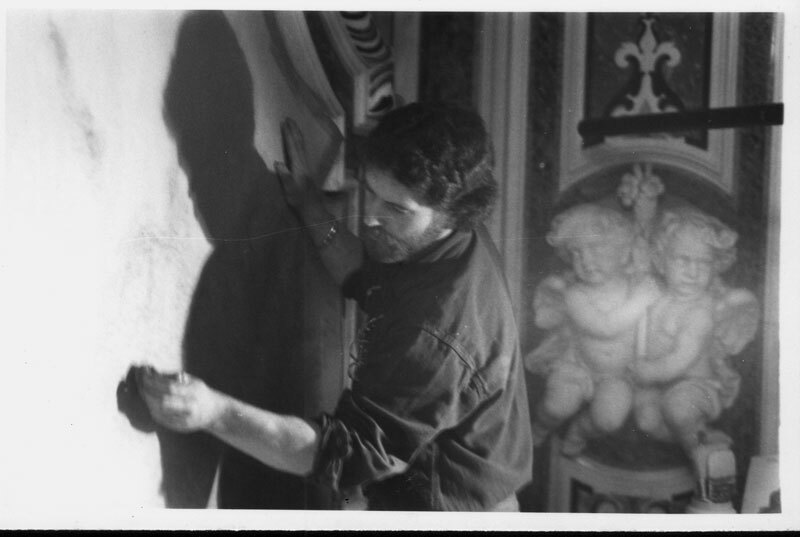 In the mid-1970’s I had a knock on my studio door in Florence Italy. I was greeted by two monks...They had come to ask if I would be interested in painting a fresco in one of the restored but empty chapels. Of course, I asked if they had inquired after the maestro Pietro Annigoni. They said they had, but because his schedule had him occupied for some time he had kindly recommended me. Of course, realizing what a great honour that would be to help in the restoration of the abbey, I accepted. I was then asked to visit and basically, select the chapel for me to produce a fresco within. Because I was the first person to be asked, besides the maestro, I had an open choice of which chapel and saint to choose. Being a protestant, I chose a subject I was most familiar with, in my belief: The baptism of Christ; The chapel of Saint John the Baptist. The chapel is well placed midway in the basilica on the left side facing the altar. There are three places which meant three subjects depicting the life of John the Baptist. An interesting commission indeed. Inside the chapel, on the left, my subject was john in the desert. 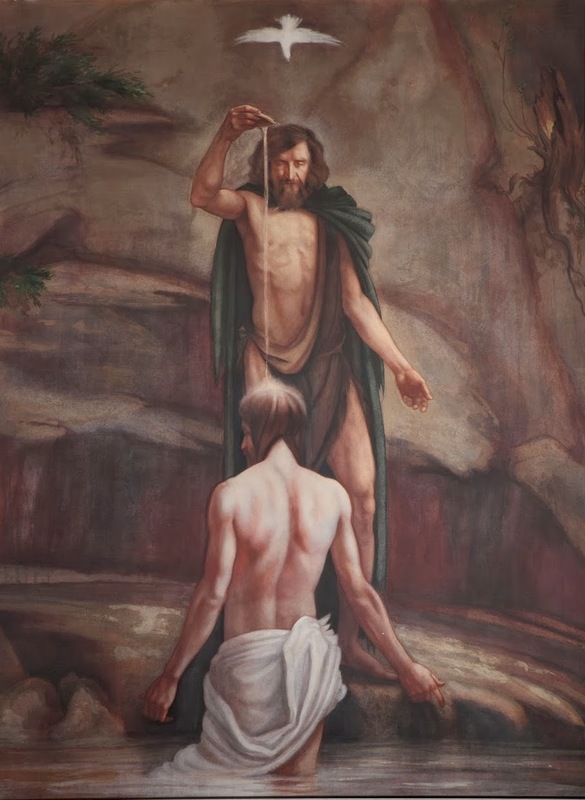 The right side: was the beheading of John the Baptist, and in the center was the baptism of Christ which was the last of the frescos to be done. His painting there is the only non-Italian artist’s work of the Abbey’s frescoes. There were three frescos executed in the chapel of St. John the Baptist, they were the first frescos to be put in the restored Basilica since its destruction in WWII, these works are studies for the alter, central fresco. Click the image above to be redirected to the Abbey MC website.